The only thing I can say now is that I am a lake person! If you’re a lake fanatic, find the answers to the most frequent questions in our Lake Garda Guide. Get some water shoes to enjoy the lake at the best and gather some great memories at one of the most gorgeous place in Italy. Where Is Lake Garda? What Town Is It In? Just to avoid some of the most typical confusions about this tiny heaven on Earth. If you are asking “what town is Lake Garda in” WE have to disappoint you. Lago di Garda is not situated inside if one town. However, with its 2,350 km2 it is an individual natural formation with more than 24 towns and villages located around the lake’s coast. The popular touristic destination is located in the northern part of Italy between Brescia on the East, Verona on the West and Trento on the North, with coordinates 45°38′ N & 10°40′E. The western part of Lake Garda belongs under the province of Brescia, the East of the lake is ruled by Lombardia province. This biggest lake of Italy sits in the middle of two super popular Italian cities – Milano on the West and Venice on the East. 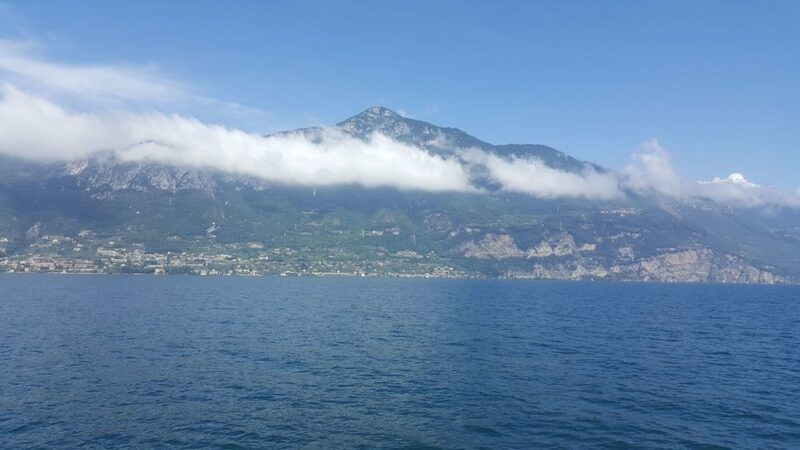 Lago di Garda, so called Lago di Benàco is around 30 kilometres long and has a specific prolong shape with wide & round bottom and narrow & long upper part. Can I fly there? Which is the nearest airport to Lake Garda? There are a few airports surrounding the turquoise lake on the North of Italy. The closest airport, especially when you’re travelling to the eastern part of Garda, is Valerio Catullo Airport in Verona. 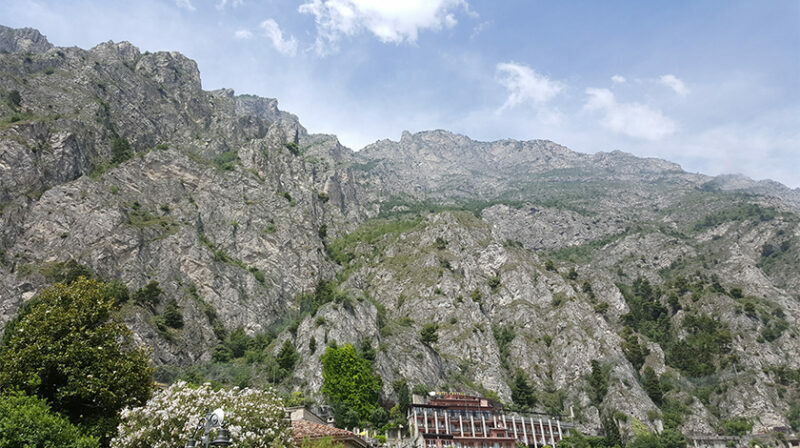 It is located just 22 minutes by car from one of the most popular southern destinations Peschiera del Garda, and approximately 1 hour and 3 minutes from Riva del Garda on the North. You can fly to Verona’s airport from Alghero, Athenes, Amsterdam, Barcelona, Belfast, Berlin, Birmingham, Bristol, Bucharest, Cancun, Cardiff, Brusel’s Charleroi, Cologne, Cork, Crotone, Dresden, Dublin, Edinburgh, Faro, Frankfurt, Fuerteventura, Glasgow, Hamburg, Hanover, Helsinki, Heraklion, Iasi, Ibiza, Karpathos, Kishinev, Kos, London, Leeds, Lourdes, Madrid, Malmo, Manchester, Menorca, Moscow, Munich, Mykonos, Newcastle, Oslo, Palma, Prague, Seville, Southampton, St. Petersbourgh, Stockholm, Tel Aviv, Tenerife, Tirana, etc., check the list here. If you didn’t find your place of departure in the list of the cities above, another option is to fly to Brescia Montichiari Airport. It ss the second closest airport after Verona and it takes approximately 23 minutes to get to Desenzano del Garda. Brescia’s airport is slightly smaller than the one in Verona, so you might find less routes and flights heading there. What’s great about Lago di Garda apart of the place looking gorgeous, is that it’s surrounded by several middle sized towns or cities. For example, the tourist magnet Venice is situated just around 2 hours and 10 minutes on the East. Fly to Marco Polo Airport mainly when you’re staying at the East of the lake. Those who chose the rockier part on the West should fly to Bergamo’s Orio al Serio or in a case of emergencies Milan’s Malpensa or Linate. If these five airports are not enough for you, there are another ones you can consider: Trento, Vinceza, Treviso, Turin, Genoa, Modena, Bologna. I Hope I Won’t Get Lost. How to Get to Lake Garda? Don’t think that choosing the best airport is the most annoying part of travelling to this lagoon of peace (it’s really a lagoon of peace, I am not exaggerating). The biggest fun starts just right after landing! If you have a valid driving licence and you consider yourself being a fearless driver, go for a car rental. But don’t underestimate the winding and narrow routes, there is always some unpredictable surprise just around the corner. Driving around Lake Garda is a fabulous experience. The landscape breaks your heart within a second. And one of the reasons this place is stunning is the specific terrain, huge mountains surrounding the lake and narrow roads. You might not experience any obstacles when getting to the southern parts of Lago di Garda. Heading to the East or North West might be at some point a bit stressful. Basically, almost the whole western, northern and northern-east part of the lake is situated on rocks and in some parts those are pretty high rocks! Anyway, if you are a good driver, renting a car and getting to the place of your holiday stay won’t be such a problem. Don’t you drive? WElcome to the club… and get ready for fun! The problem is waiting for those who can’t rent a car and have to rely on public transport. And the public transport is almost like being in hell! WE were getting to the western part of the lake, to Toscolano Maderno. WE flew to Malpensa which was the only option WE could choose that date and it took us ages to get there. The flight from Malaga itself took comfortable 2 hours and 20 minutes. The way from Malpensa to Toscolano Maderno was approximately 5-6 hours long compering to 2 hours spent in a car (according to Google Maps). The problem is the connection between Garda’s towns and bigger cities around but also quite chaotic system at the Milan’s main railway station. 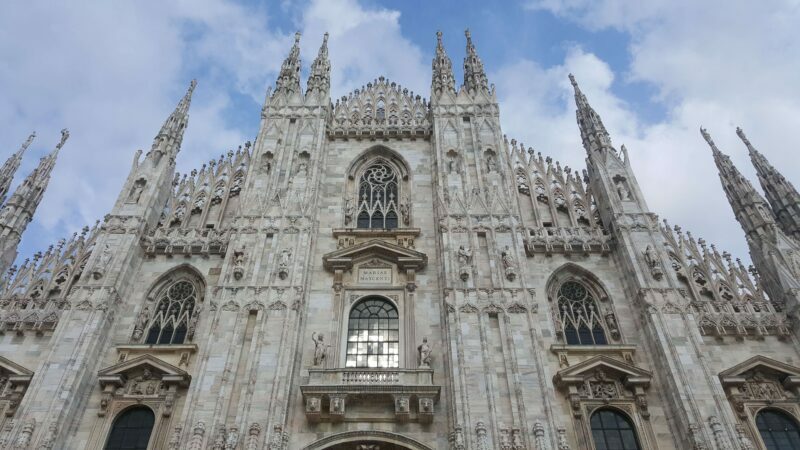 When flying to Milan, specifically Malpensa airport, you have to get firstly to the city centre. The easiest way is to take a train, well a pretty expensive train. For one hour of journey you pay around 13 euros pp. As a comparison, Barcelona’s shuttle is around 6 euros pp each way. The biggest chaos happened at the Milan Main Railway station. The first problem was basically this – shall we travel to Desenzano or to Brecsia? The second problem was actually to find a train going to the destination we chose. There are a few Italian rail companies and each of them offer different routes with different prices. To find the best journey was more than limited – there was no exact schedule showing all of the itineraries. The machine of company A was – for sure – totally different as the machine of company B. While one showed you all the towns the train stops in, the other machine gave you just the final destinations so you had to guess. The best option seemed like using the power of Internet. It was quicker to surf online than to get the information at the railway station itself! The trains in this part of Italy are also quite pricey. I think that €17 for a 40 minutes journey it’s a quite high price. Which doesn’t change the fact that Lake Garda is great! BUT you do so! Be also very precise when checking bus routes over Garda Lake. It looks like there are plenty of buses but they go just during a certain year’s period. Read the schedule really carefully and be aware that a bus can take hours and it might be missing an aircon. Coast to Coast. How Much Are Lake Garda Ferries? WE used ferry transport twice during the one week holiday in June. The price for a single ticket was around €15 for an hour trip starting at Toscolano Maderno and finishing at Limone del Sur. RECOMMENDATIONS: You will be incredible freezing when sitting upstairs in the front or in the middle area so take a jacket with you. It can get really windy over there. On the other hand you can get super hot when seated at the back of the upstair area, the air doesn’t get there. Money, Money, Money…. Is Lake Garda Expensive? WE would say that it depends where you come from and it depends where you’re staying at Lake Garda. More well-known parts as Sirmione and Limone might be more expensive than the other ones. WE stayed in Toscolano Maderno and got really surprised by cheap pizzas and reasonable prices of drinks. For a comparison, we paid €4.00 for Aperol Spritz in Toscolano, while in Limone a glass ( a tiny one…) was already €5.50. Classic Margarita in Toscolano was in a range from €4.00 to €5.00, while in Limone it cost one euro more. The most expensive prices were in Sirmione were we paid for a below average sandwich with ham and cheese the same price as for super tasty Margarita in Toscolano. What surprised me the most were prices for transport, especially train and ferries. Recommendations: If you really don’t have to, don’t drink beer. It doesn’t meant it’s not nice. Its just overpriced. Get some nice Italian drink or tasty local wine instead. Brescia’s airport is slightly smaller than the one in Verona, so you might find less routes and flights heading there.